The World Cup is significantly less exciting if you don't declare an allegiance to at least one team. The most common way to choose a team is to go with the country/countries your ancestors came from. In my case, Scotland last qualified in 1988 and Wales has been absent since 1958. True, I was born in Australia and hold Australian citizenship, but for whatever reason, I'm not all that inspired by the Socceroos. Also, I find the Australian obsession with sport and the expectation for dominance to be tiresome. There, I said it. 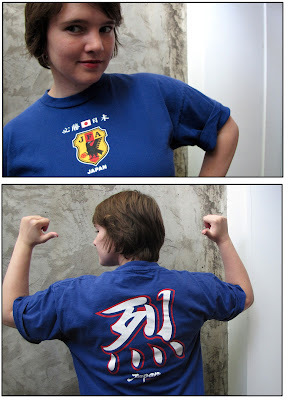 I was fortunate enough to be living in Japan when that country co-hosted the 2002 World Cup. Naturally, I got really caught up in all the celebrations and partying around Osaka and Kobe. For Japan's Round 1 match against Russia, I found myself in an enormous make-shift screening room off a back alley in Shinsaibashi. Hundreds of us were packed in there - it was most likely illegal. We all stood crushed together watching and reacting to the game, with bottles of various alcohols being passed around. And then Inamoto scored, and then the game ended and it was the nation's very first World Cup win. Thousands of us crowded into the streets to party: everyone was so delighted and proud of the team. I watched Samurai Blue fans, men and women alike, jump into Dotonbori Canal in celebration (it's an Osaka tradition). Dotonbori Canal contains some of the most unnatural waters you'd ever see, plus it's full of broken umbrellas, stolen bicycles and Yakuza victims, so it requires a certain overwhelming exuberance to jump in there. I was swept up in the joy of the victory and the great attitude of the fans, so that's why I still support Japan today. With the exceptions of baseball and martial arts, it seems to me that Japan has assumptions of inferiority when it comes to sports. Whenever there is a win, it is usually chalked up to superior teamwork and fighting spirit as opposed to strength and ability. It is that teamwork and fighting spirit that I appreciate from the Japanese team. Sportscasters always comment disparagingly about the smaller stature and slighter builds of the Japanese players, as if one has to be a great big bruiser to be able to run fast and kick. The Japanese and South Korean teams have demonstrated their speed and endurance, and Japan is able to make the best of being fouled by physically dominant opponents. Did you see those free kicks? Beautiful stuff. This World Cup, Japan has shown its skill to those who dismissed them. With two wins, 2010 is already Japan's most successful World Cup campaign. The match against the heavily favoured Paraguay starts very soon. A win for Japan would be a real upset but I don't think it is impossible.